KIEV, Ukraine -- Ukraine's acting prime minister blames Russia for recent clashes as the Federation continues to mass forces on its borders. Russian servicemen drive armoured personnel carriers on the outskirts of the city of Belgorod near the Russian-Ukrainian border. It came as Russia’s foreign minister Sergei Lavrov reiterated to the German foreign minister in a phone call that Ukraine’s use of the army must be halted in its country. Earlier Mr Lavrov had warned Kiev that it would face justice for a "bloody crime" in eastern Ukraine, where the government has been acting against rebels. "They (Kiev) are waging a war on their own people. This is a bloody crime, and those who pushed the army to do that will pay, I am sure, and will face justice," Mr Lavrov told a meeting of diplomats. 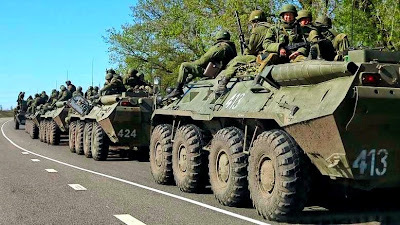 The massing of Russia’s forces on its border prompted Ukrainian Prime Minister Arseniy Yatsenyuk to accuse Russia of wanting to start "a third world war". Mr Yatsenyuk said that Russia wanted to occupy Ukraine, creating a conflict that would spread to the rest of Europe. He said: "The world has not yet forgotten the second world war, but Russia is already keen on starting a third world war." "All responsibility for aggression on Ukrainian territory and for undermining international security and stability rests with the leadership of the Russian Federation." On the ground, Ukrainian special forces launched a second phase of their "anti-terrorism" operation, blockading the rebel-held city of Slavyansk. Reports that pro-Russian snipers had shot at a Ukranian military helicopter in the eastern town of Kramatorsk have been treated cautiously. According to officials in Kiev, the helicopter exploded at a military base after being hit by a rocket-propelled grenade. Sky's Foreign Affairs Editor Sam Kiley, in Ukraine, said that the "bellicose" rhetoric between Russia and Ukraine was escalating more quickly than action on the ground. He said suggestions that residents allied to Russia were being intimidated were not true. Pro-Moscow rebels holding the flashpoint town of Slavyansk vowed on Friday they would never give up. "We will not surrender the town," their leader Vyacheslav Ponomaryov told a news conference. "We will resist as long as possible. The town is blockaded. We are ready to defend it." Ukrainian authorities, who sent the army into Slavyansk on Thursday in a brief incursion that killed one militant, said on Friday they were encircling the town to prevent rebel reinforcements arriving. Mr Ponomaryov, self-styled unelected mayor of the town, has publicly called for Russian troops to be deployed to the area as "peacekeepers". Meanwhile, US journalist Simon Ostrovsky, who was captured and released by pro-Russian militants, says he believes he was used as a "bargaining chip" with Kiev after his abduction. Writing for Vice magazine, he said: "After spending hours alone on the floor of a damp cell … I was led into a room where I was accused of working for the CIA, FBI, and Right Sector, the Ukrainian ultra-nationalist group." UN chief Ban Ki-moon has warned that the crisis is threatening to "spin out of control" and urged all sides to "refrain from violence". During the separatist movement in Russia during nineties and early 2000 in the North Caucuses Russia set a precedent of using force against its own people. And now has no right to dictate to Ukraine how to handle separatist movements. If Ukraine would follow Russian example in Chechnya the situation would of being stabilized long ago. Russia is acting as a hypocrite when suppress its own separatist movement, killing thousands of civilians in Chechnya and now they want to teach Ukraine. One of my Grate Grandmother was from Russia, she lived on the river White (not by her own will)in today's Ufa region to the age of 46. She was killed by Stalin during mid 1930th. Her name was Anna Goncharova, her mother lived to the age of 103 and she belong to Russian nobility regardless of that her parents was prosecuted in early 1800, labeled as "Dekabristy" and exiled to the Ural mountains. History of Moscow Russia is bloody and unjust. After Russian occupation of Crimea I consider my self 100% Ukrainian. Russia will continue to antagonize more and more of Ukrainian and its own population. Lets wait for a year or two and results of Russia's actions today against Ukraine will back fire. Today, isolation of Russia in the near future is inevitably. All Ukrainians Around the World Unite. United Ukrainian Front must save the ancient Rus' people.